There is increasing interest for geothermal energy spurring from all corners of the globe, and the number of geothermal energy countries is increasing according to the GEA (Geothermal Energy Association). 10,715 megawatts of geothermal power is currently being produced in 24 countries, and in 2010 it generated 67,246 GWh of electricity. This is a rise of about 20 percent since 2005. By 2015 the figure is expected to grow even more to 18,500 megawatts, since there is a variety of projects currently underway and many under consideration. Many of these projects are in areas that were before thought to have little resources to exploit. It’s important to point out that even though Iceland is towards the bottom of the list, more than a quarter of this country’s electricity comes from geothermal sources. The United States is the leader by far in geothermal energy countries, and in 2010 its 77 power plants produced a total of 3,086 megawatts of installed capacity. A geothermal field in California called The Geysers holds the largest cluster of geothermal power plants on earth. The second country after the U.S. is the Philippines, with an online capacity of 1,904 megawatts. About 18 percent of the total electricity generated in the Philippines comes from geothermal power. You may nit have expect Kenya to have made this list, but this country is at the forefront in Africa when it comes to renewable energy. 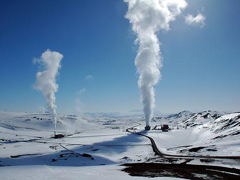 (To read about the main benefits of geothermal power, click here). The GEA found that while there was a lot of growth in existing countries using geothermal power, a huge increase in countries beginning to pursue projects with geothermal power has also occurred. There are currently 70 countries that have geothermal projects under consideration, which constitutes a 52 percent rise from the last GEA report in 2007. Two regions of the world that are seeing the most growth in projects under development are Africa and Europe. In 2007, 6 African nations were identified, and now there are 11 that are working actively to produce geothermal energy. In Europe that number grew from 10 nations in 2007 to 24 nations in 2010, which is more than a two-fold increase. GEA’s executive director, Karl Gawell, says that we are only utilizing a small portion of our potential in geothermal energy. Even if the lowest possible projections were assumed for geothermal power, most nations do not utilize their geothermal energy resources to their fullest, if at all. In 1999 thirty-nine nations were identified, which could potentially provide 100 percent of their power from geothermal resources, which are domestic, clean, and renewable. However, only nine of these countries have geothermal power online. So, there is still a long way to go, but the development potential is huge. (To read about investing in geothermal stocks, click here). Posted on August 22nd under Geothermal Energy.